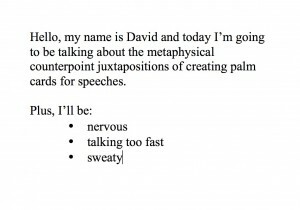 I’ve created a template to print your own speech palm card template for your kids’ school speeches or your own! In my case the school wanted palm cards of the size 10cm (100mm) by 7cm (70mm), so that’s the free template you can download in MS Word .docx format for free by clicking here. 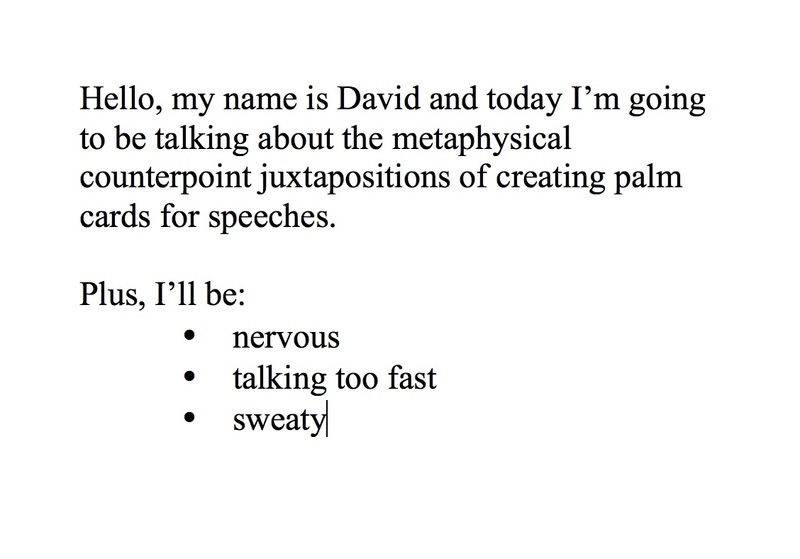 If you need to create different sized speech cards than the template I’ve done, then just go into Microsoft Word’s Format > Document and navigate to the Page Setup window. In there you should see the ability to select different sizes, including the ability to ‘Manage Custom Sizes’. If you select that, you have the ability to create your own sized document (which is all I did to create the template you found here). Given the huge number of versions of MS Word I can’t really be more detailed than that I’m afraid. Hope that takes one small piece of stress out of the speech creation experience! So are snarky comments. If you check your downloads folder you’ll see the template is there – some browsers will create a blank page at same time as downloading the file. You’re welcome. Thanks David. Just what I was after. Cheers Rob . This were super helpful! Thank you so much! Glad it’s useful, even if only for a little while! wow this is so good :))))) and so easy! I’m really confused there is just a blank page that is really small? is that just me or did I do something wrong? how do u print 6 per page? This was perfect for my sons year 3 public speaking. Printing 6 pages per sheet works a treat. Thanks heaps David. You’re most welcome Steve, glad it worked well for you. No problems Cass glad it was useful! You do understand what a template is don’t you? Literally all of the kids in my class use this. It’s super helpful and much easier then making them the perfect size yourself. Thanks Charlotte so glad it’s useful! Good on you for creating such a masterpiece!! When I print mine off 6 per page they’re all really small. If I increase the font size there’s going to be too many cards as less words will fit. Any suggestions? saviour. writing my wedding speech and it’s a god send. thank you.